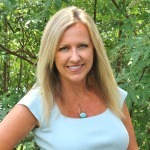 When I was a child, I lived far back in the forest, on a Lake Michigan beach front home. It was the most wonderful place on Earth in my young eyes. This is where I found my fondness for white paper birch trees. 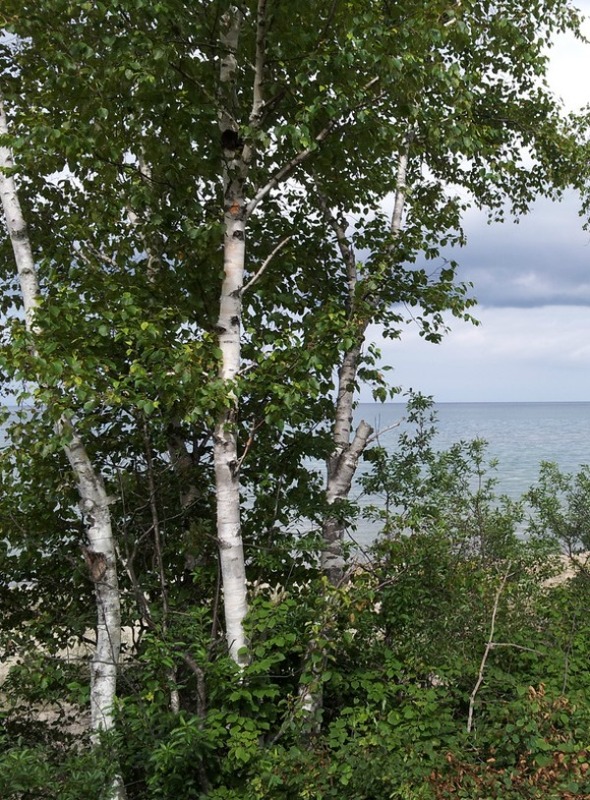 Now, we didn’t have many of these right on our property, but down the beach a few miles was a state park, and they had the gorgeous, peeling, papery white river birch trees. I remember peeling the bark, and being scolded for doing so! Ha! “It hurts the trees Kimberly!”, my mom would say. Ahh, the forbidden fruit! 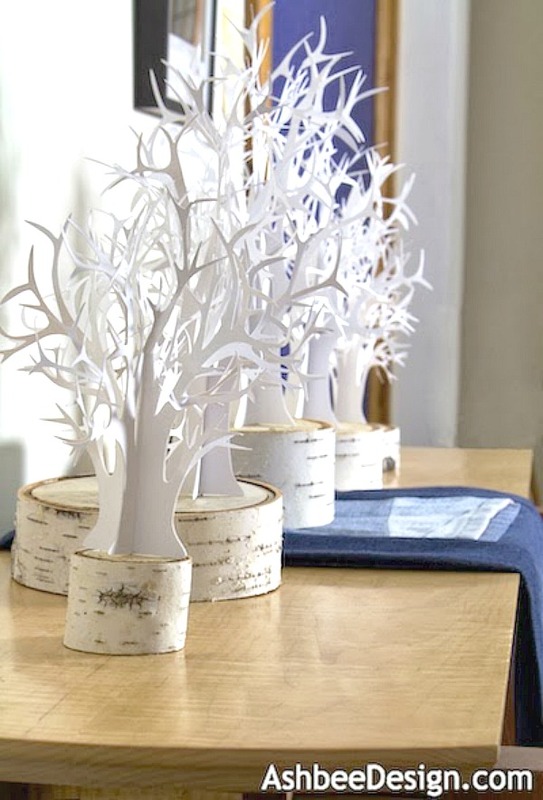 Decorating with birch, natural or graphic, is now a super hot trend and you will love all of these unique ways to bring a bit of the woods indoors with birch. Down here in Virginia, we don’t have the white birch but we do have lovely and lacey River Birch Trees. I collected bark from a neighbor’s fallen tree to make this Pottery Barn inspired Birch Bark Candle. 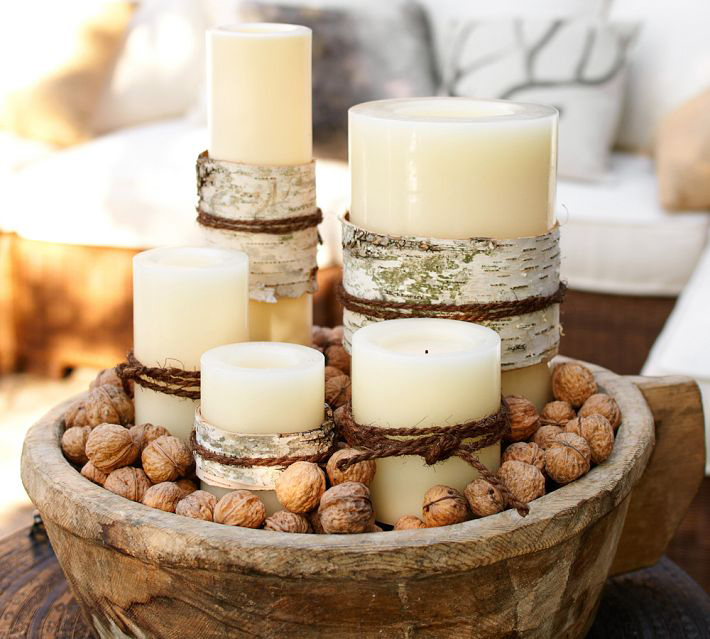 This Birch Candle Centerpiece is perfect for fall. 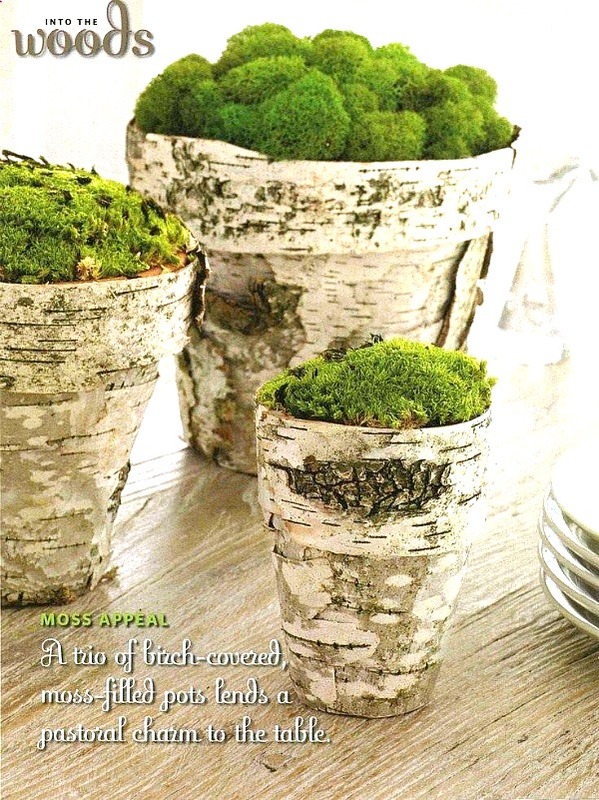 And for a spring centerpiece, the acorns could be replaced with green moss. Wouldn’t that be lovely? 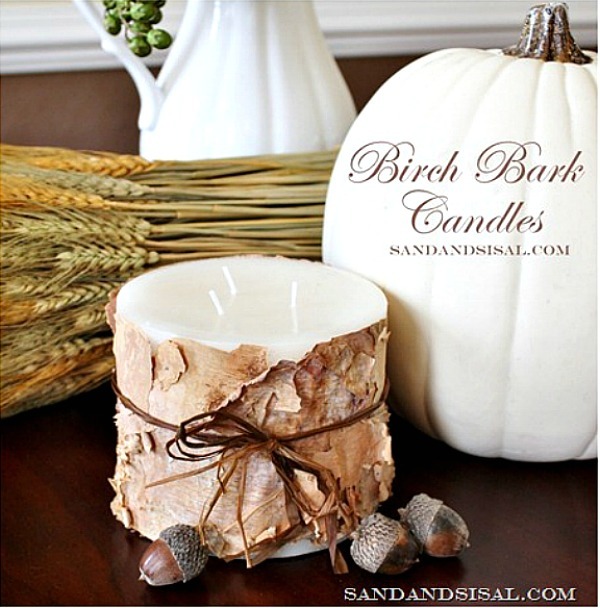 Drill holes into a few cut branches and insert votives to make Birch Candles in Hurricanes. 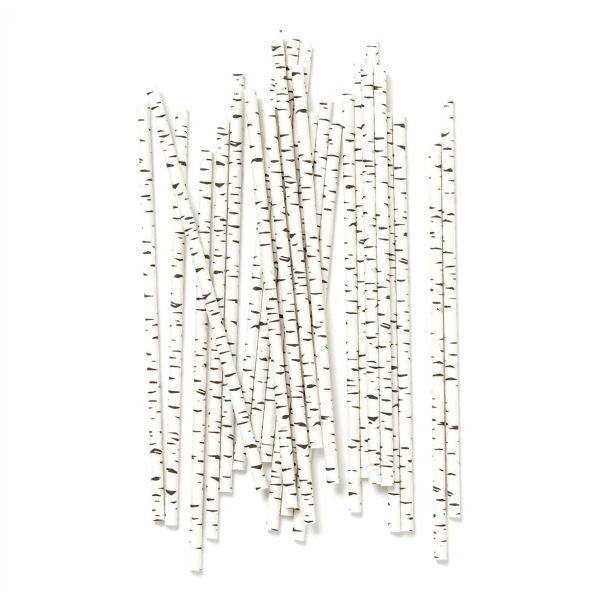 How adorable are these Birch Straws? 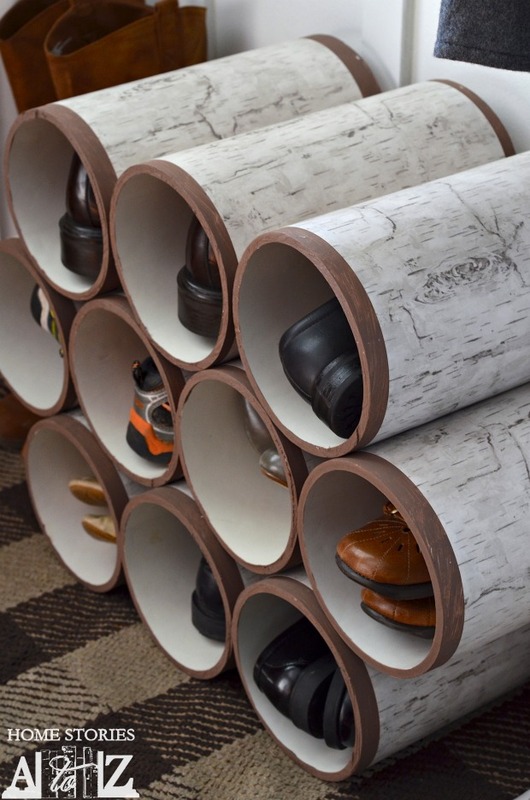 My little sister Beth from Home Stories A to Z created a birch log inspired PVC Pipe Shoes Organizer for her mudroom. So clever! 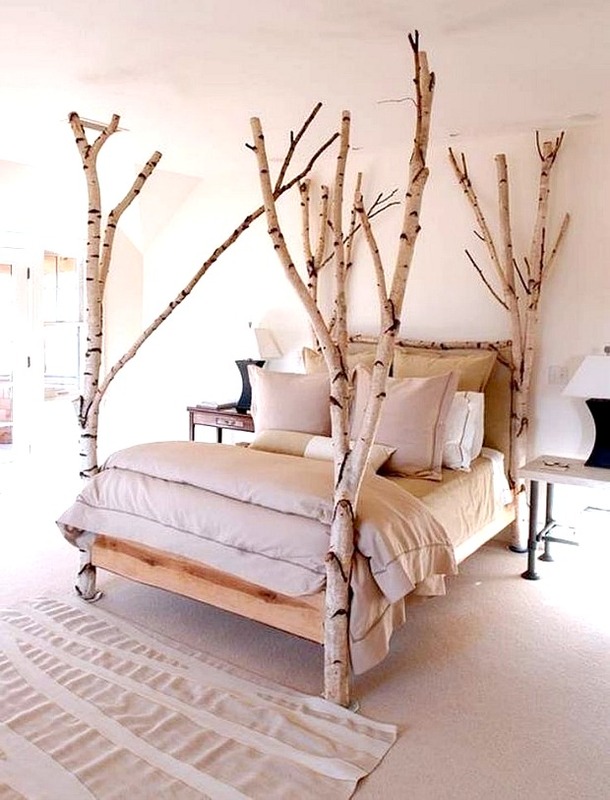 Walk into your own private woodland retreat with this dramatic Birch Wood Bed. 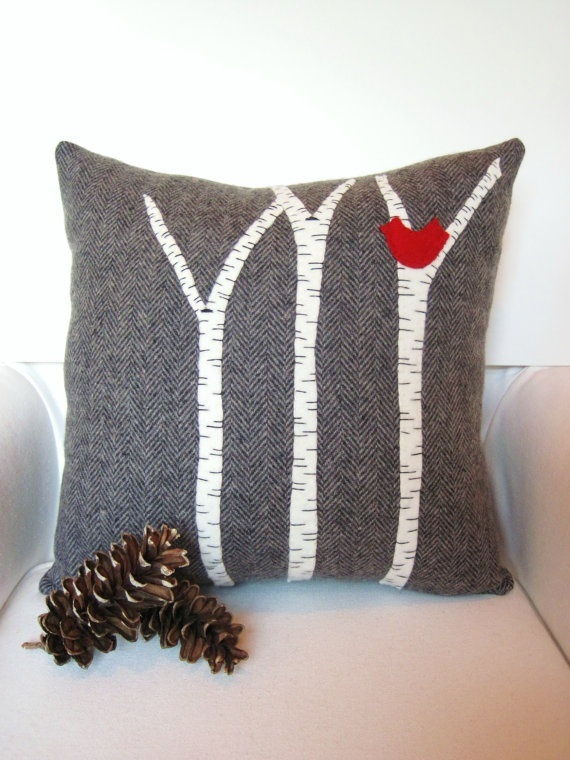 Accessorize your sofa with this cute Birch Branch Pillow. 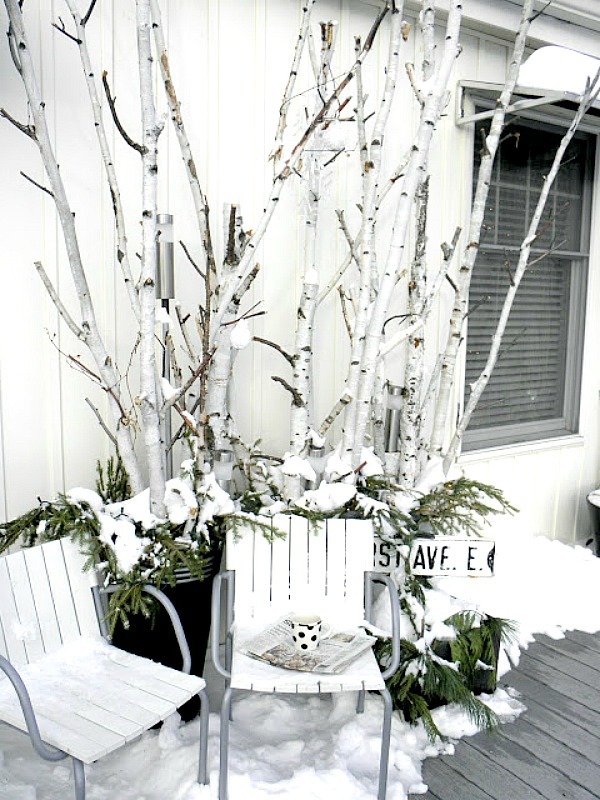 It might be cold and snowy outside, but this Birch Branch Winter Porch Decor beckons you to take a seat and sip some hot cocoa! This baby’s room is absolutely adorable, decorated with birch tree wall decals and little owls. 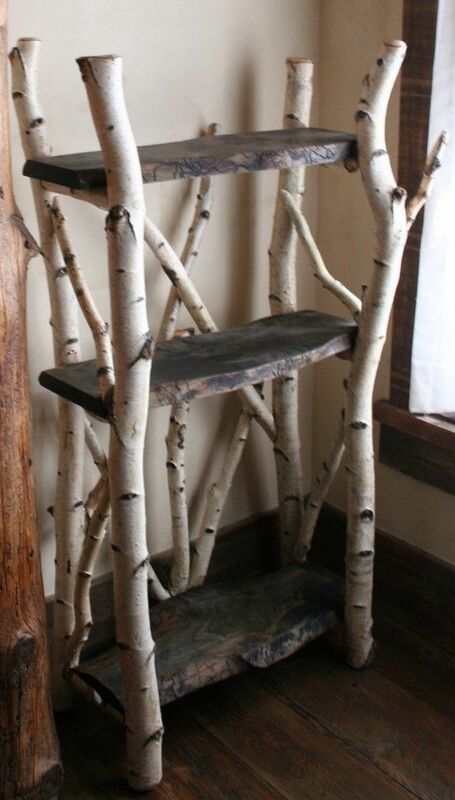 These are just a few examples of decorating with birch. 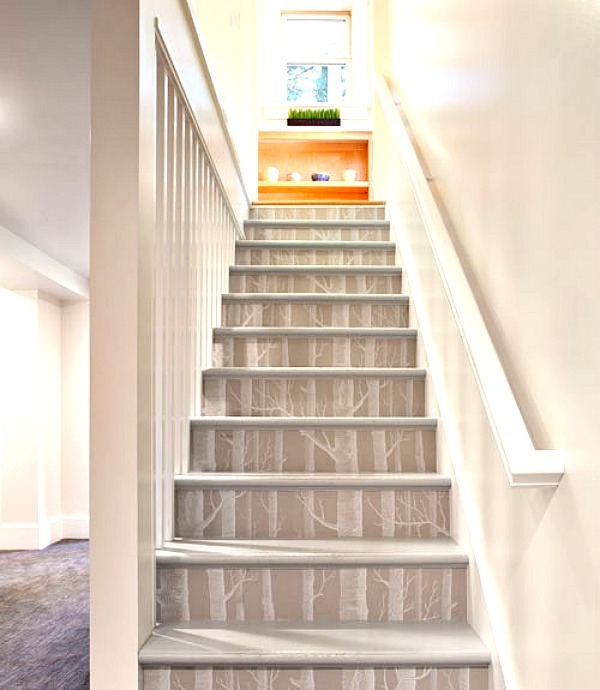 There are birch wall stencils, birch fabric prints, and birch bark printed rugs even. Whether you like using real birch or just the representation of it, birch looks like it will be a popular decor trend with staying power. So many wonderful decorating ideas! I absolutely love birch. I am in love with a painting I saw somewhere of a forest of white papery birch trunks with a single red cardinal in flight. If I can’t find it and buy a copy, I’m going to do my best to recreate it because that image is burned into my mind. 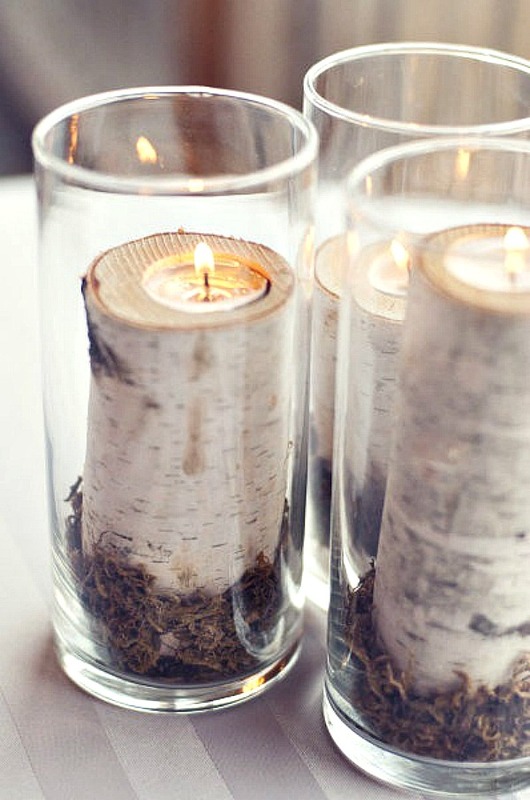 And I’m going to make some of those birch wrapped candles, too! 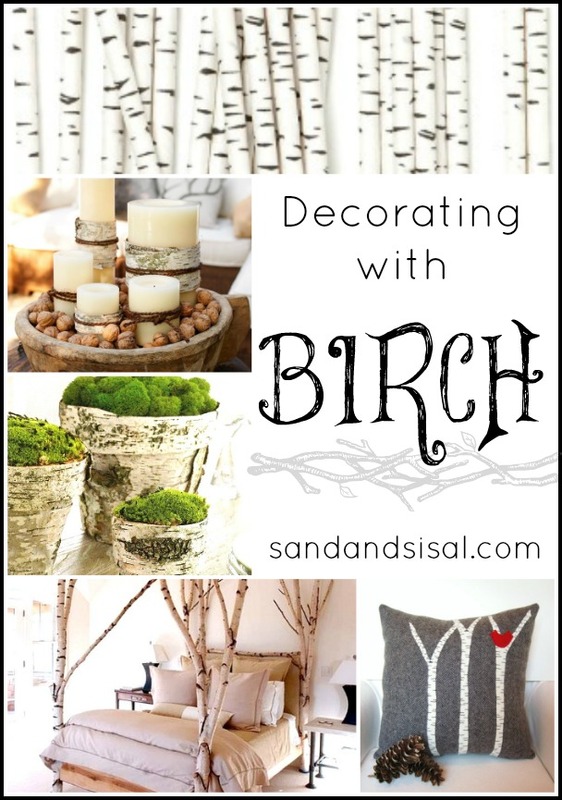 I posted a “decorating with Birch” a few weeks ago. After the Christmas ice storm here in Toronto, I was able to collect several nice straight branches. Still deciding what to do with them. In the meantime, my amazing quilting niece created this quilt… http://www.layitonmebaby.com/1/post/2014/02/the-modern-quilt-guild-riley-blake-challenge-quilt-is-complete.html I love your birch finds. Thanks! I also did a multi-post series on using the birch theme. The overview post filled with additional ideas is here. Hope you find more inspiration!